In 2016, the District of Columbia Public Schools (DCPS) launched the nation’s first fully-funded global travel program for students, sending approximately 400 students and educator chaperones on short-term trips abroad during the summer. The goal of DCPS Study Abroad is to make travel more equitably accessible to students in middle and high school who are studying world languages. DCPS’ Global Education team was tasked with creating this innovative program, and once we had moved past the logistical difficulties of coordinating a program of this scale, we were faced with a number of other challenges, including how to ensure families felt secure in sending their children overseas, how to allow students to share about their experiences, and how to effectively capture program successes. To address these concerns, DCPS Global Education asked each trip to create a blog. 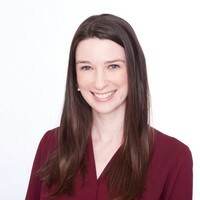 Educators could use the blog as a convenient platform for communicating with parents and families when cell service might be spotty or when the group is too busy to make 20 individual calls. In writing posts, students would have space to reflect upon their experiences and to share their stories. Blogs also served as a great way for DCPS to collect photos and anecdotes to be used to promote the program in years to come. Early on, DCPS Study Abroad groups used a variety of platforms to create their blogs, but for the summer 2018 program, DCPS Global Education recommended that groups use Kidblog. DCPS invested in district-wide Kidblog licenses in August 2016, and educators across the city are able to use it with students for instruction. To provide safe and easy classroom use for teachers and students, Kidblog has been securely integrated with the District’s student information system (SIS). An integrated program already familiar to our students and our educators, Kidblog also allowed students to submit work individually but provided staff with an opportunity to review prior to publication and ensured that external content was more age-appropriate than some popular free blogging platforms. The DCPS Global Education team worked with the DCPS Digital Learning and Innovation team and Kidblog staff to roll out 24 trip blogs in 2018. 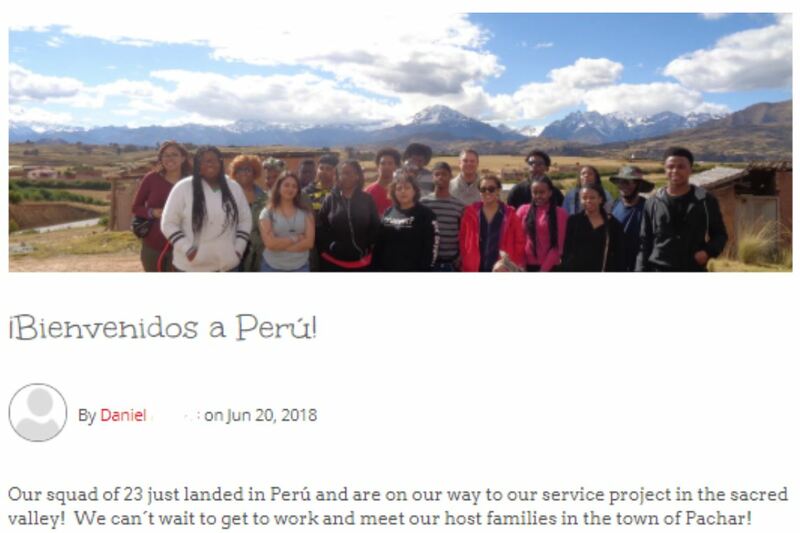 Kidblog created the blogs and rostered all students and educator chaperones in advance, so travelers simply had to log in and their trip’s blog was loaded and ready for the road! If you are planning to travel with students, consider setting up a trip blog for your students and for yourself. The DCPS Global Education team has found this to be an excellent tool for our DCPS Study Abroad program to maintain connections between students, their families and the community at large. For most program participants, DCPS Study Abroad provides their first opportunity to travel outside of the United States and for many, their first time to leave the DC metro area. Homesickness is a challenge that students frequently face while on tour, and time apart can also be difficult for families. Excessive calls and texts to family and friends back home can sometimes exacerbate feelings of homesickness; blogging allows students to feel connected to home while still staying present in their experience. Using their trip blog, educators and students can communicate effectively and efficiently with parents. Rather than fielding multiple emails and calls from parents checking in, DCPS encourages educator chaperones to consider their blog as the primary method of communication with parents while on tour and before departure. Chaperones will generally use their blog to share trip announcements or summarize progress. For example, educators may announce a flight delay, or relay the good news that their group arrived safe and sound in their destination. Prior to leaving the country, many groups will also use their blog to share pre-departure meeting information and reminders of important program deadlines. 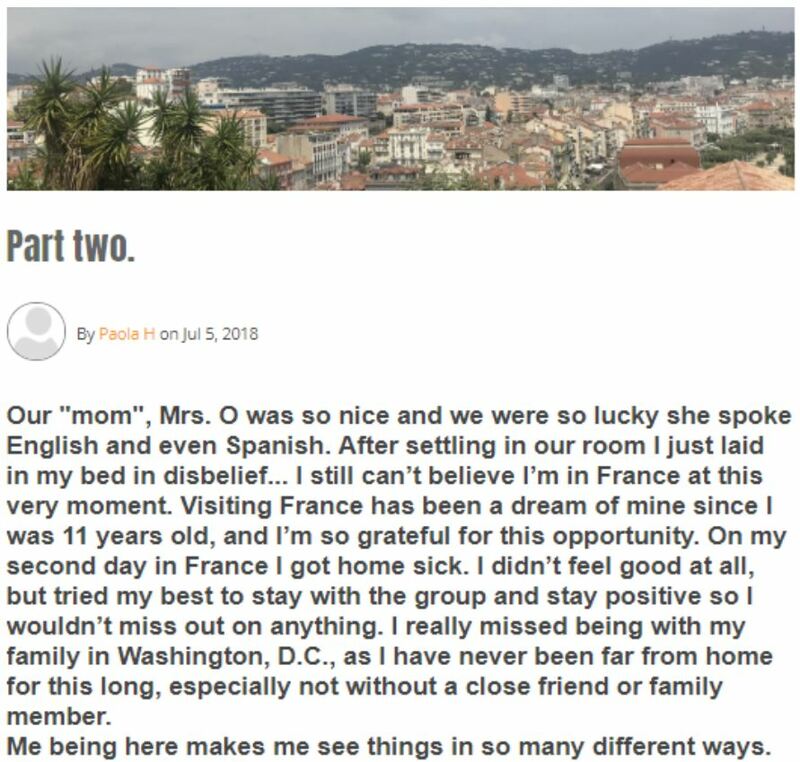 Providing a space for students to write about their experience while on the road creates an opportunity for students to truly reflect on their time in a different environment. In considering what is most interesting or important to share in their writings, students naturally make comparisons to their life back home, unpack challenges they faced that day and reflect on memorable moments. Thanks to an on-going research project with the George Washington University, DCPS has data demonstrating that DCPS Study Abroad helps students to grow as individuals. Upon their return from travel, 60% of DCPS Study Abroad participants report that they are more open-minded and 71% report an improved sense of self-confidence (Engel, et al 2018). Program-wide blogging gives students a structured process to unpack the unique experiences they are living while outside of their comfort zone. Having an outlet to share with an interested and invested audience allows students to reflect on their learning. DCPS Study Abroad is still a relatively new program, and DCPS is always looking for ways to share what the program is and why it is so important. Community stakeholders are keen to hear directly from students, and trip blogs provide a straightforward way for anyone interested to follow along during travel season. Once student posts are reviewed for content, they are made public and DCPS Global Education publishes all blog links on its website, so anyone interested can easily access. With hundreds of posts and pictures shared, the DCPS Study Abroad blogs are a reliable source of authentic and compelling material about the program. Most importantly, these collected materials are from the students’ perspective. With 85% of DCPS Study Abroad participants identifying as students of color and 86% receiving free or reduced meals, DCPS Study Abroad provides travel opportunities to students who are historically underrepresented in study abroad programs and the educational travel industry. Our students offer a unique lens on the abroad experience and cross-cultural interactions. Our trip blogs allow us to capture and showcase students’ individual experiences. To date, DCPS Study Abroad has facilitated fully funded global travel to 18 countries on five continents for over 1,400 students and educators. Interested in learning more about DCPS Study Abroad or reading more student posts? Visit http://dcpsglobaled.org.